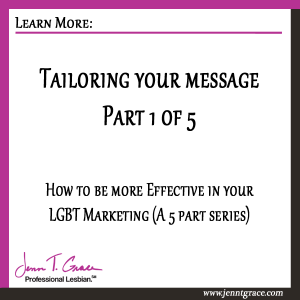 This is part 1 of 5 of the 5 part series of How to be more effective in your LGBT Marketing. 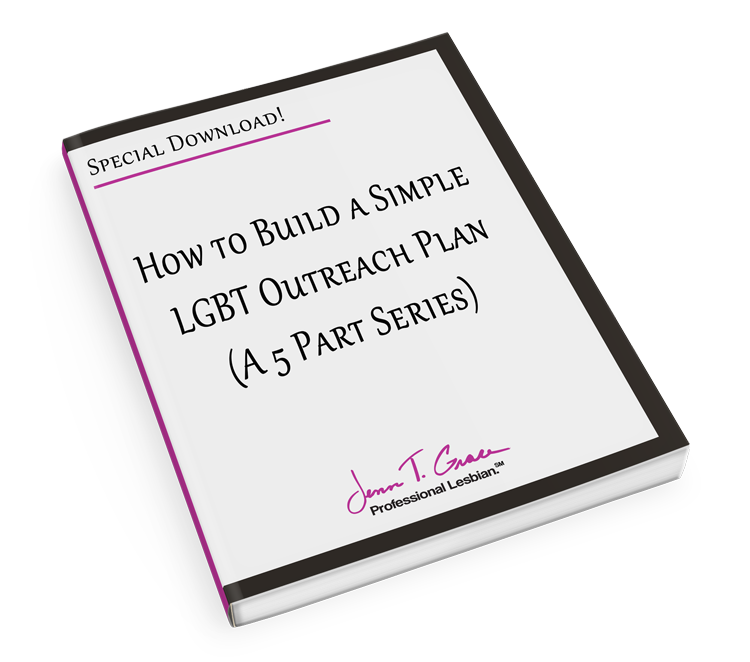 Tailoring your message is one of the key things you must do to have success in your LGBT outreach. In my book “No, wait… You do look gay! 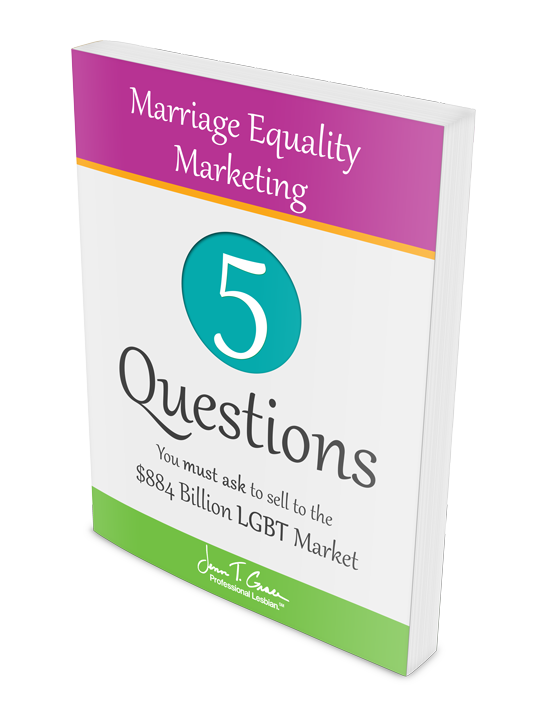 The 7 Mistakes Preventing You from Selling to the LGBT Market” I wrote about this topic in great detail. Chapter 1 is dedicated to breaking down the myth that the LGBT community is one large mass of people who think, believe and act the same – this is the furthest from the truth. 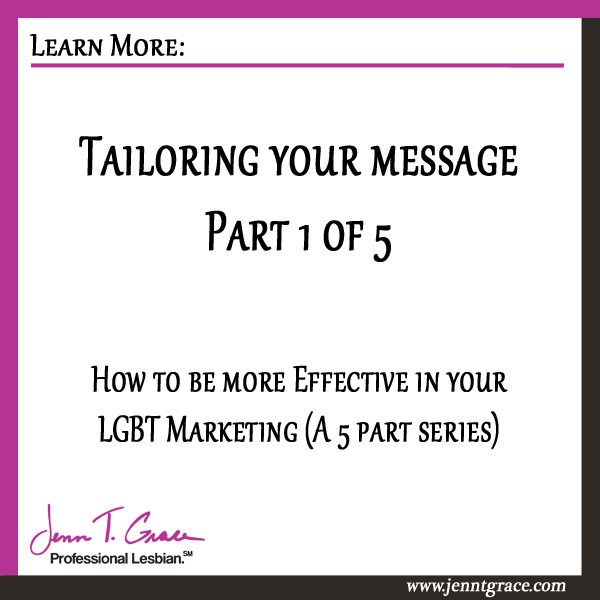 In order for your marketing message to resonate with potential LGBT customers, you need to make sure you are tailoring your message to a specific subset for LGBT people, not just the ‘gay community’ broadly. Since you are a reader of this blog I am going to give you a taste into chapter 1 of the book. Below is a page direct from the book. Every marketing and communications touch point from your company to the community must be specific and not just a blanket statement of ‘We are gay-friendly.’ For example, an advertisement encouraging me to book one of your cruises should not have young gay men on it if you are trying to reach me – a lesbian with a family. Let’s discuss this a bit. When you are preparing any targeted outreach effort for a potential audience of your product, you do your homework and your research; you identify key demographics and psychographics, correct? The same should apply for the LGBT community. Simply being part of the LGBT community is not targeted enough. If you are marketing to me, for example, I am a Generation X (on the cusp of Gen Y), married, lesbian mother of two small children. Regardless of your product – marketing to me versus one of my single lesbian friends or married Baby Boomer friends would be different. This difference is based upon factors outside of the commonality of being lesbians.  This is by far one of the biggest pitfalls I’ve seen companies make when preparing their LGBT outreach efforts. Not only is sending your gay men’s cruise flier to my lesbian household a waste of your marketing dollars, but it is also sending the message that you don’t know what you are doing because you are throwing us all into the monolithic heap of ‘LGBT people to market to’. You are better off not doing anything at all if you are going to treat the community as one large undifferentiated mass of people. When speaking with people, I’ve found that the best way to demonstrate this poor planning is to look at how deodorants are marketed. If you see a commercial for Secret for Her versus a commercial for Old Spice for Men – would you ever wonder if Secret was trying to market to men and Old Spice was trying to market to women? Of course not. The deodorant companies’ marketing is geared very specifically to their individual target customers. 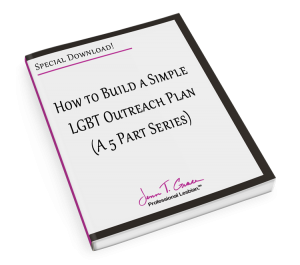 This is no different as it relates to your LGBT marketing efforts. Another example is if you think about the advertising you would find in AARP magazine. AARP is geared to people who are 50+. Now imagine if a cruise company were going to market in their magazine. They would include people who are 50+ in that magazine, right? Now how would readers react if there was an ad for Spring Break featuring a bunch of 20-year-olds? Chances are they would think the company doing the advertising has no idea what they are doing because if they did, they would know 20-year-olds are not reading AARP. This is the same message you are sending when you aren’t tailoring your LGBT marketing to the right audience. Of course, if you want to know the rest you’ll have to get a copy of No, wait… You do look gay! 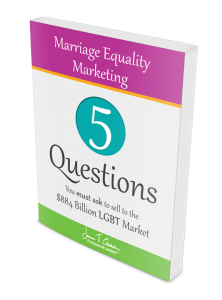 The 7 Mistakes Preventing You from Selling to the LGBT Market.” And check out part 2 in this series!